Sometimes when I ask which children’s book someone’s student or child is reading, I get an embarrassed “Magic Treehouse” response, as if there’s something wrong with the Magic Treehouse series. They seem harmless to me. Then I read this one, in time to send to my second-grade grandson for St. Patricks Day… And I changed my mind – they are not just harmless, they are terrific. I personally love the way that historical fiction is woven into a story accessible to young readers. The facts are available at the end, and also in a companion children’s book. The characters come alive. And all of it makes the world of reading magical, informative, and fun. What is there to be embarrassed about, I wonder? I mean, I really wonder! The writing is fine for a seven or eight-year-old. Sure, they will outgrow this particular children’s book in time. But I think they serve a great purpose. 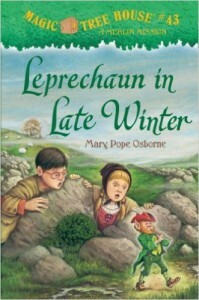 I personally learned a lot more about leprechauns and Irish fairytales after I read this delightful children’s book. And I’m also grateful that I was not required to read all 42 previous books to be able to step into this one seamlessly. There is a lot of heart in Osborne’s writing. She gives us children whose characters are real – they get impatient, curious, stubborn, and also they hold on to the belief in magic. My own feeling is that up until the age of 9, when children may stop believing in the magic, I hope that a children’s book like this continues to be by each child’s bedside. Happy St. Patrick’s day!